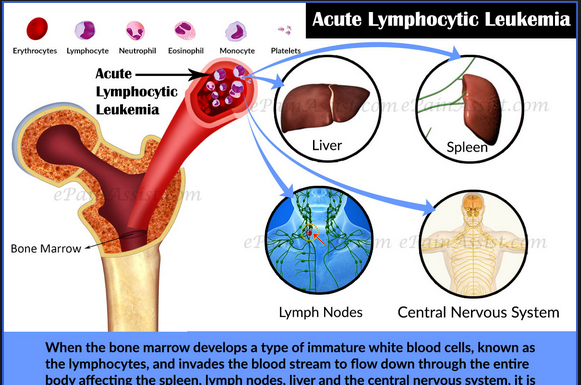 Acute myeloid leukemia is primarily a cancerous disorder of white cell production in the spongy bone marrow. It is chiefly due to a mutation in the DNA responsible for white cells production. White cells, which eventually will become myeloblasts, are produced in abnormally large amounts. These myeloblasts are not mature in any sense. They will be so abundant in the blood that they will later replace the matured white cells. Since immature cells cannot do what the mature cells can do, the integrity of the protective functions of the white cells becomes faulted. This is when different symptoms will start showing up. Not less than 20,830 fresh cases of AML are documented in the US every year. Symptoms of acute myeloid leukemia? Bleedings from the gum and nose: The gum can even become swollen. This might occur frequently. Excruciating pain in the bones. High risk of experiencing bruises. Undefined loss of body weight. Heavy menstrual bleeding in affected women. There is a DNA which is directly involved in the manufacturing of white cells. When there is a defect in it, it begins to misbehave. It begins to produce an unreasonably large amount of white cells right in the spongy bone marrow. These cells lack the ability to grow to maturity. So your blood is jammed with white cells that are immature. These immature cells are called myeloblasts. Before you know it, they have all become fruitful to the extent of dominating the blood. They will, in essence, replace the previously existing matured healthy white cells. They also have a negative effect on the bone marrow as it may stop functioning altogether. 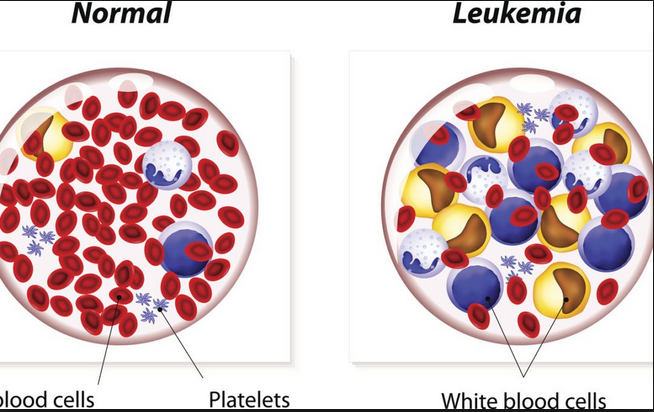 These cells will later become leukemic in nature and they are responsible for the symptoms you are or will be having. While doctors are still battling to discover what might be responsible for this DNA mutation, there are speculations that certain drugs, radiation therapy, and chemicals could be solidly behind it. Age, gender, lifestyle, certain genetic disorders, and work nature or location can all predispose you to have acute myeloid leukemia. The risk triples with age with the average age being 67. Men seem to have a bad luck with it. If you have an irresistible penchant for a cigarette, then be as well set to ‘get’ acute myeloid leukemia. Does the location or nature of your work have something to do with benzene or benzene-related products? Then you might have a very high risk if you are always exposed to such substances. You’ve got Down syndrome or myelodysplasia? You are also susceptible big time! You see all these risk factors I have just mentioned, they are not all a valid proof that you will have acute myeloid leukemia. But they can make you have it anyways. The first thing your doctor will likely do is perform a physical assessment on you. He will look out for swollen spleen, liver and lymph nodes. He will likewise run blood tests on you to find out two things – the presence of anemia and the number of white blood cells in your blood. All these tests are not confirmatory. To confirm whether you have acute myeloid leukemia, a biopsy will be done on sample tissues from your bone marrow. The site on your body where the bone marrow will be accessed with a needle is the hip bone. The breastbone is another choice place to get the tissue. Leukemic cells can be assessed from fluids gotten from your spinal cord. A lumbar puncture or a spinal tap can achieve this. Remission induction therapy: This therapy involves the use of chemicals to get rid of those bad leukemia cells present in your body. This procedure is mostly done in the hospital. In essence, you will have to be hospitalized. This is so because, in the process of getting rid of the bad leukemia cells, some of the good cells will be killed. This will open you to infectious diseases and uncontrolled bleeding. In promyelocytic leukemia, which is a rare form of AML, it is possible to kill only the bad cells using special kinds of anti-cancer drugs. Arsenic trioxide and all-trans retinoic acid are the most commonly used drugs for this purpose. These drugs don’t only kill the leukemia cells; they also prevent them from further dividing and multiplying. Post-remission therapy: You can choose to call it by the name ‘consolidation therapy’. It is very important in preventing a relapse from a remission. This therapy is targeted at destroying residual leukemic cells. A stem cell transplant might be needed. Stem cells help your body to manufacture healthy new cells right in the bone marrow. They can be from you or from another person called a donor. If you have once had leukemia, your doctor might have extracted and stored some stem cells for a future use. When you use your own stem cells for a transplant, it is called an autologous transplant of stem cells. Stem cells obtained from a donor is riskier than those gotten from you. The only risk using stem cells gotten from your body is that of experiencing a relapse. This will be due to the presence of some amount of leukemic cells in the stem cells obtained from your body. Detection of the illness in its early developmental stage and swift curative actions can be of huge help as high remission is possible. You are said to be in remission if all the symptoms disappear eventually. And if the disappearance of the symptoms is not less than five years, your AML will be considered cured. If you have any signs of AML especially recurrent infections and fever, do not procrastinate seeing your doctor for appropriate diagnosis and commencement of treatment. Limit the rate at which you get yourself exposed to benzene and radiations. Wearing a protective clothing or gear when you don’t have a direct control over this substances can help you limit how much of them you are exposed to.